Extender for firefly Necklaces. Need a little bit of extra length? Available in oxidized Silver Tone only. 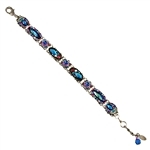 Double Mosaic Bracelet multi color silvertone This is the revival of the original Mosaic Bracelet. Double Mosaic Bracelet in new color SOFT. This is the revival of the original Mosaic Bracelet. Swarovski crystals and Czech glass beads. Matching necklace and earrings available.